Recently, Los Angeles County brought on Gary Gero as its first ever Chief Sustainability Officer. 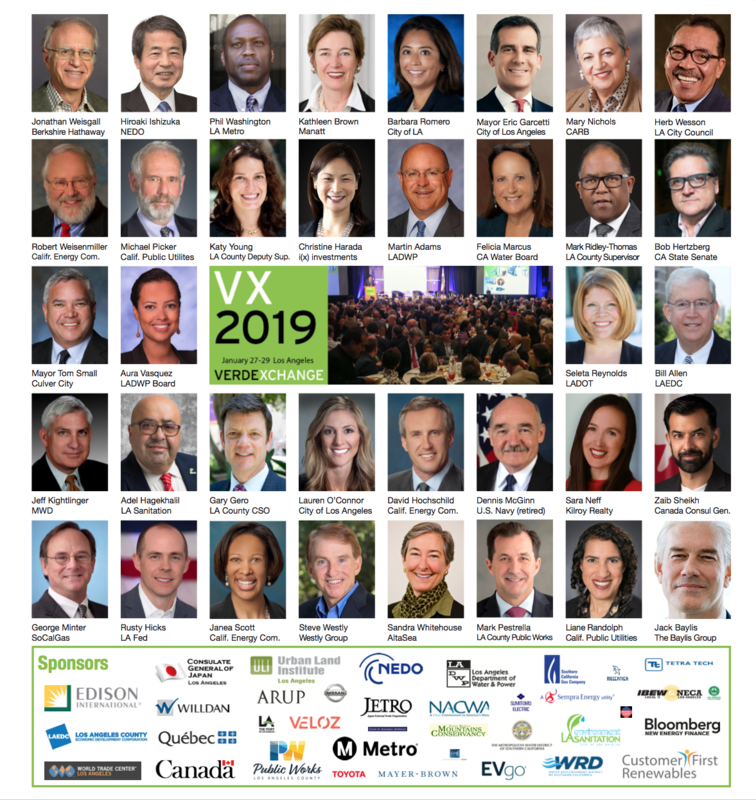 VX News sat down with Gero to outline his strategies for achieving stormwater, clean energy, and public transportation goals. Los Angeles Times Publisher Austin Beutner and California Governor Jerry Brown engaged this month in a dialogue about the state's drought and climate-change challenges to come during "Water in the West," held at USC. Brown delves into an explanation of the Bay Delta tunnels and the challenges of water governance in California. VX News offers edited selections from the event, beginning with an introduction by USC President Dr. C.L. Max Nikias. As state and local bodies scramble to accommodate the California drought by regulating use and reconsidering traditional sources of water, suppliers must adjust to changing conditions. 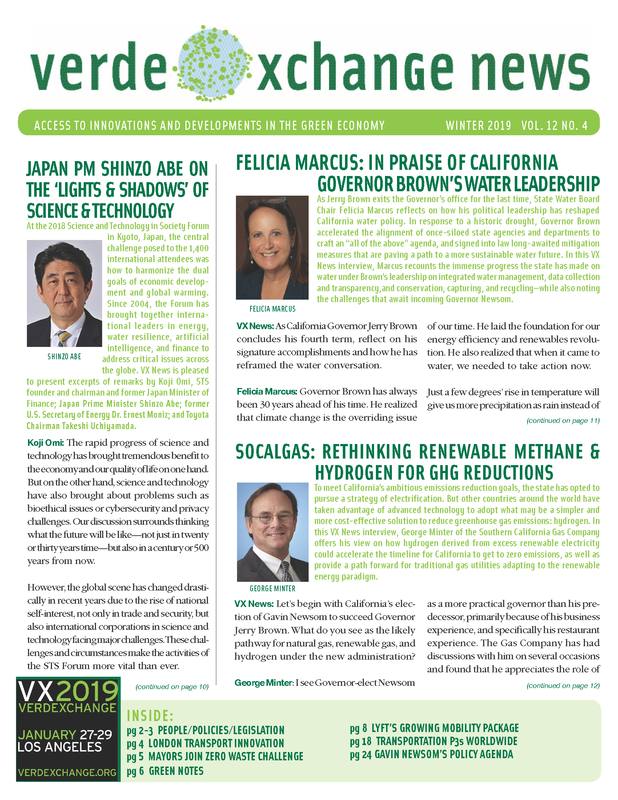 In this interview, VX News asks Jeff Kightlinger, General Manager for the Metropolitan Water District of Southern California, about the implications for the region. Kightlinger comments on options for meeting supply needs, including desalination and stormwater capture. He also notes that despite potential conflict over water sources between urban and rural areas, ultimately collaboration—and an agreement to share the burden of behavioral change—will be necessary to get to goal. Jeff Kightlinger, General Manager for the Metropolitan Water District of Southern California, oversees the the nation’s largest water wholesaler in a period of severe drought. VerdeXchange News presents an edited version of Kightlinger’s speech “Water is Serious Business,” given to Town Hall Los Angeles on September 22 and reprinted courtesy of Town Hall Los Angeles. He covers MWD’s responsibilities, as well as its strategy in light of the state’s high temperatures and lack of precipitation. Kightlinger touches on California’s water bond and the Bay Delta Conservation Plan—both issues of vital concern to customers and constituents. At the USC Center for Sustainability’s Spring Forum on May 6, titled “Envisioning Drought Resilient Cities,” Founder and President of TreePeople Andy Lipkis shared the unprecedented success Australia experienced after its citizens installed rainwater-capture cisterns on their homes during the country’s historic 12-year drought. Lipkis discussed how, in the face of changing weather patterns due to climate change and with fewer trees to capture, clean, and store rainwater than we once had, those living in cities must mobilize to collect as much precipitation as possible—and local water agencies must work together on stormwater solutions rather than remaining in isolation. VX News has included an edited transcription of his remarks. California Governor Jerry Brown may have declared a drought emergency this Spring, but for many in Southern California water conservation is never ending—in great measure the result of the foresight and investments of the Metropolitan Water District of Southern California. In the following VXNews interview, Jeff Kightlinger, General Manager of MWD, specifically details the ongoing preparation and response his regional water agency has championed in the face of the driest calendar year in California’s history. Kightlinger additionally addresses recent adjustments to the Bay Delta Conservation Plan (BDCP), planning for a water bond for the November ballot, and meeting the goals of California’s AB32.